Do Hedge Funds Love Navistar International Corp (NAV)? We have been waiting for this for a year and finally the third quarter ended up showing a nice bump in the performance of small-cap stocks. Both the S&P 500 and Russell 2000 were up since the end of the second quarter, but small-cap stocks outperformed the large-cap stocks by double digits. This is important for hedge funds, which are big supporters of small-cap stocks, because their investors started pulling some of their capital out due to poor recent performance. It is very likely that equity hedge funds will deliver better risk adjusted returns in the second half of this year. 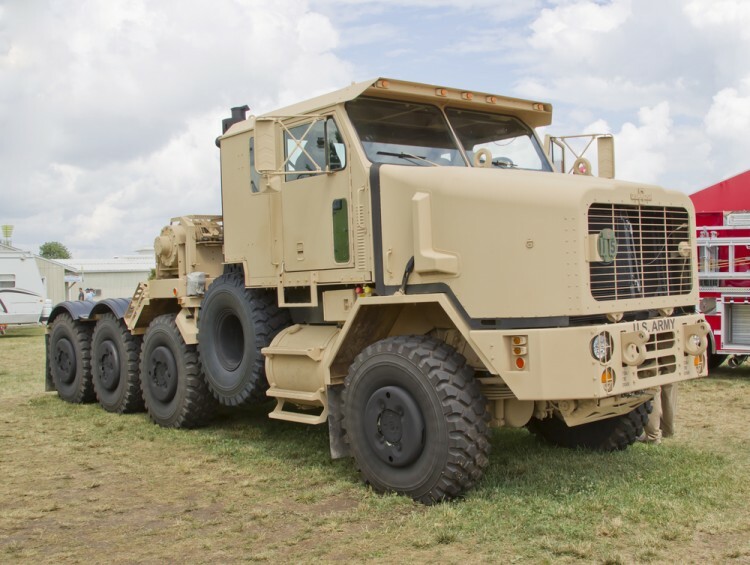 In this article we are going to look at how this recent market trend affected the sentiment of hedge funds towards Navistar International Corp (NYSE:NAV) , and what that likely means for the prospects of the company and its stock. Is Navistar International Corp (NYSE:NAV) a bargain? Hedge funds are in an optimistic mood. The number of bullish hedge fund investments went up by 5 in recent months. NAVwas in 18 hedge funds’ portfolios at the end of September. 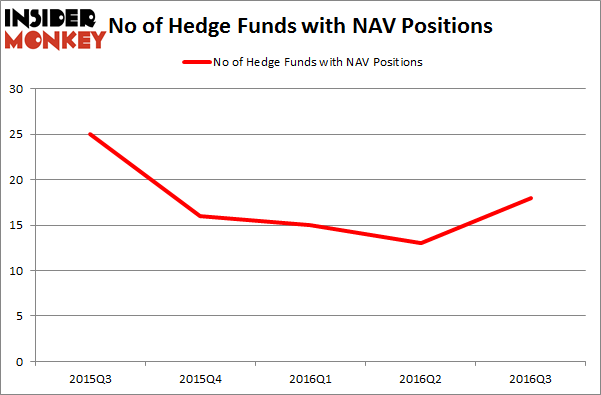 There were 13 hedge funds in our database with NAV holdings at the end of the previous quarter. At the end of this article we will also compare NAV to other stocks including Integer Holdings Corporation (NYSE:ITGR), Eros International plc (NYSE:EROS), and ScanSource, Inc. (NASDAQ:SCSC) to get a better sense of its popularity. Now, we’re going to take a look at the recent action surrounding Navistar International Corp (NYSE:NAV). Heading into the fourth quarter of 2016, a total of 18 of the hedge funds tracked by Insider Monkey were bullish on this stock, a jump of 38% from the second quarter of 2016. Below, you can check out the change in hedge fund sentiment towards NAV over the last 5 quarters. So, let’s find out which hedge funds were among the top holders of the stock and which hedge funds were making big moves. According to publicly available hedge fund and institutional investor holdings data compiled by Insider Monkey, Icahn Capital LP, led by Carl Icahn, holds the number one position in Navistar International Corp (NYSE:NAV). According to regulatory filings, the fund has a $372.5 million position in the stock, comprising 1.9% of its 13F portfolio. On Icahn Capital LP’s heels is MHR Fund Management, led by Mark Rachesky, which holds a $371.4 million position; 26.2% of its 13F portfolio is allocated to the stock. Remaining professional money managers with similar optimism include Mario Gabelli’s GAMCO Investors, D. E. Shaw’s D E Shaw and Youlia Miteva’s Proxima Capital Management. We should note that none of these hedge funds are among our list of the 100 best performing hedge funds which is based on the performance of their 13F long positions in non-microcap stocks. Biotech Movers: Heat Biologics Inc (HTBX) And Achaogen Inc (AKAO) How Big Lots, Inc. (BIG) Stacks Up To Its Peers Is WebMD Health Corp. (WBMD) A Good Stock To Buy? Infosys Ltd ADR (INFY): Are Hedge Funds Right About This Stock? Has Hedge Fund Ownership in Welltower Inc. (HCN) Finally Bottomed Out? Should You Buy BJ’s Restaurants, Inc. (BJRI)?